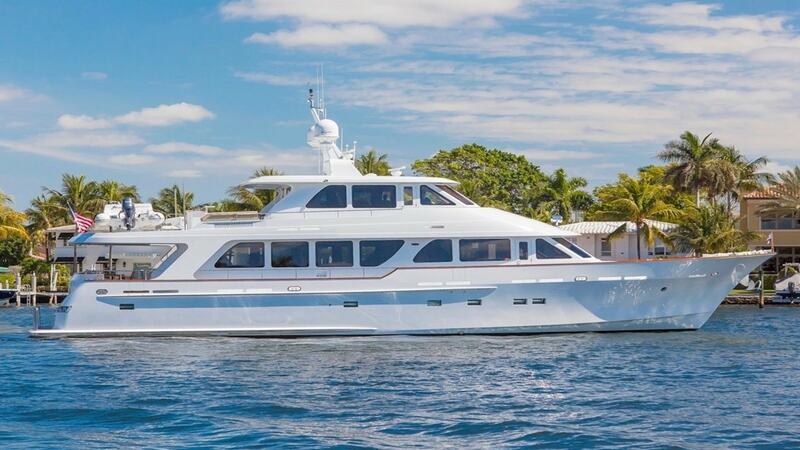 This classic 92’/28m motor yacht, Anndrianna was built in 2007 by the British Columbia family owned shipyard Rayburn Yachts and last refitted in 2017. She can accommodate up to six guests in three spacious staterooms, including a full beam private master finished in sapele mahogany and earth tones. Two additional staterooms are complemented by queen sized beds with ensuite facilities. Being one of the finest yachts in her class, Anndrianna offers an extremely quiet and comfortable cruising performance with vast variety of interior and exterior dining options. The spacious sky lounge boasts a fabulous area for entertainment essentially providing a second upper salon with updated A/V systems and a wet bar. Another highlight on this yacht is the aft facing bar on the upper deck that allows guests for unbridled views of the horizon.